To me, self improvement means becoming a more educated, more productive, more valuable and wiser person. This is a follow-up post from yesterday, where I talked about making saving fun – you should also spend a reasonable amount of money on self improvement. Every business allocates money for R&D work. This is an investment toward a better future by bringing in new innovation on product/services, generating more sales and profit. As individual money earners we are no exception, and should spend money on things that can increase or enhance our future potential to earn – not only monetarily. Self improvement brings an overall gain in personality and acceptance from the outside world, including your own family. I agree that there are ways to improve yourself for free. Attending church every Sunday is one of them. The local library is one of the most frequently talked about self improvement spots. You can read books, rent DVDs on self improvement, and even use exercise DVDs to avoid paying for a gym membership. A $300 tread mill at home pays itself off in slightly more than one year, considering the average gym membership costs around $20 a month, give or take. In my experience, investing in yourself almost always pays back (though it might take time), whether in increased self-confidence, more friends, or a job where that newly-learned skill sets you apart from your coworkers. Attending Toastmasters International classes to improve on public speaking ($46 for 6 months). I am only in my 4th month but started getting early results. I feel butterflies in my stomach much less these days when speaking to large audience. To get into a leadership position in my company, I have to not only garner public speaking courage but also I need to engage my audience throughout my speech. This investment is expected to pay off by a huge margin. Getting a pedometer to measure my steps ($18). I am walking at least 5000 steps per day to keep my weight below 150 lbs. Although there is no way to measure the direct benefit of this, over the years the potential savings on medicine, doctor visits, etc. can be significant. Paying for the blog. I had to pay for the domain registration and hosting services ($98 per year). Again, the potential return in terms of my personal financial knowledge alone is huge; I won’t even go into the monetary advantages. I also pay for proofreading of my articles, and now I am saving almost 15-30 minutes per post as I no longer have to read and reread them. New Clothes. I don’t know exactly how much I’ve spent on clothes. I budgeted for ties and watches, and in the last year I bought about 6 ties, 3 watches, and a suit. That’s a lot of spending, I admit. But collecting watches and ties is one of my hobbies and I take pride in it. I view this as the cost of this pride – not exactly for self improvement, but again, it boosts my morale indirectly. Really, I mean it! I believe if I am meeting my responsibilities, saving for retirement, and avoiding debt, I can spend my hard-earned money on something I truly enjoy doing. Your Money Or Your Life, the book. When more than 10 personal finance writers recommend a book, you can’t just ignore their advice. When I borrowed the book from the library, I liked it so much I wanted to keep a copy forever. Amazon had it for $5 and change including shipping. This is one of the most priceless possession I have in my personal collection. Although I haven’t spent anything on my health apart from mandatory health check-ups and few medicines here and there, my neck is giving me trouble and I want to start a few acupuncture sessions. (SMB got a lot of help from acupuncture therapy for her hand and shoulder pains). I am not sure if paying for acupuncture really qualifies as self-improvement. Additionally, in the next year or so, I plan to invest in some classes and certification exams, all job related. I plan to increase my investments in my blog and my health. I will probably buy a bike very soon. As far my readers are concerned, let me remind you that spending on self-improvement is possibly the best favor you can do yourself. Of course, as a bread and butter provider for your family, your first duty is to provide the necessities. At the same time, spending on yourself does eventually improve your family as a whole. Don’t try to improve upon all your weaknesses at the same time. You are not in your school days when you could learn many subjects at the same time. You have one tenth of the time to improve yourself that school kids have. Try to prioritize your investments. Make sure you are committed to the cause (example: gym membership) and continue to participate once you have spent your money. If a goal requires a huge cost (example: education), talk to your friends, spouses and bosses before you make a decision. Remember to sacrifice if your goal creates conflict with another family member. (You might not agree to it, but I am willing to discuss). 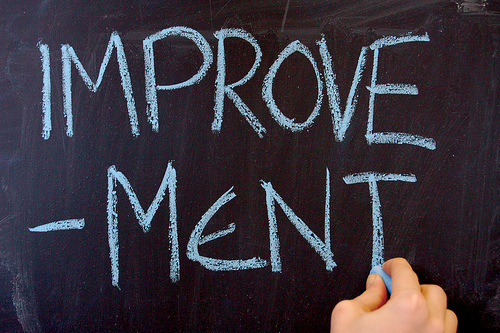 Readers, let us know what your self improvement plans are for the next few months/years. Do you feel these are necessary expenses? Investing in yourself is probably the best investment you can ever make. But, like all things, it takes a high level of commitment, and all of those channel-changing, no-patience, ADD types will have trouble. Sometimes watching TV, not channel changing, gives some value, yesterday I was watching Us open final and it really relaxed my mood and body. Got some boost and adranaline rush seeing Rafa and Noval fight it out. It was just one of the examples. Basically whatever improves you as a person you should be able to spend on, basically the rat race is to improve yourself and how people perceive you, right? If businesses need investment to grow, so do us. I haven’t found much value in tv lately, which is why I got rid of my cable service. I have to say that all of the time I have for reading has definitely given me much more enjoyment. I believe you are watching news and sports through your computer, right? very frugal choice no doubt and if you don’t get a dollar worth why should you pay $40 per month. I agree. US open was available on internet as well for free. Great job with the self improvement investment. Toast master is a great organization and I’m planning to join one of these days. Mrs. RB40 is an active member and organizer. Excellent point on companies spending on R&D – self-improvement is pretty much R&D for the soul! Excellent post SB! Glad you liked it MC! What a great post! I so need to try Toastmasters. Speaking in front of people is paralyzing for me. Absolutely paralyzing. I do enjoy walking, and try to incorporate it into my daily routine. It definitely makes me feel better physically and emotionally. Well, I used to get near paralyzed till a year ago, gradually improving Toastmaster really helps. Great topic SB. Investing in yourself does pay dividends. Toastmasters is great character building stuff, stick with it. What types of watches do you collect? haha, basically every kind..steel, gold plated, leather, sport, dress, water proof, pendant…many kinds. I like your suggestions too about not trying to change everything overnight and I agree… sometimes compromise or sacrifice is inevitable. Thanks Andrea, it was your first comment and probably first visit ever, did you like my blog? yup saw your posts at the forum, your site rocks! I dropped my gym membership years ago when I set up a home gym. I constantly reflect on my weaknesses and try to improve. I look at my expenses the same way. I review them monthly trying different tings. Chocolate therapy is my go-to self improvement tool! 🙂 Just kidding, but great post! Investment in oneself always pays good dividends, as long as it’s wisely chosen. In the past I spent money to learn real estate investing starting with a $3,000 investment. That investments led to me making more money, reinvesting some of it in more education, and eventually made resulted over a million dollars in profits earned over the following 5 years. This year I’ve invested in a speed reading course, several marketing & entrepreneurial programs, and regularly attend workshops and lessons for one of my passions, swing dancing. I may be the extreme, but I’ve found that spending money to increase my skills and knowledge has dramatically enhanced my life in every area. I really love this post. This is a great guideline of inspiration as self development for a men. For Daily Inspiration And Motivation For Everyday Life Challenges.